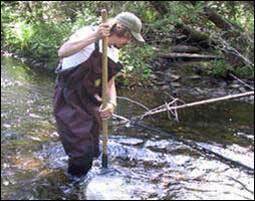 From 2003 to 2005 a benthic monitoring program in three local cold water streams monitored the health of these aquatic ecosystems. Benthic monitoring involves collecting bottom samples from the streams to identify and count the macroinvertebrates, or bottom dwelling organisms, present in the water. Since some of these species are sensitive to disruptions in their environment they are good indicators of the health of the aquatic ecosystems. In 2003, the Bruce Peninsula Biosphere Association established a partnership with the Ontario Benthos Biomonitoring Network (OBBN) to initiate a long term monitoring program on the Northern Bruce Peninsula. 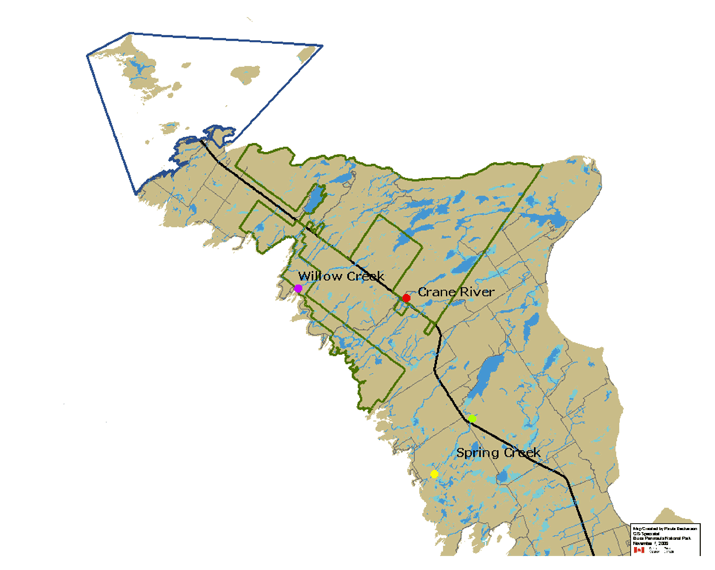 Seven monitoring sites were established along Willow Creek, Crane River and Spring Creek to collect baseline data on their overall health and monitor changes to the ecosystem (See Map). At each site along the streams, benthic macroinvertebrates were collected and several chemical and physical tests were conducted to gain an overall understanding of the streams’ health. This data not only provides an understanding of our local aquatic ecosystems, but it also contributes to a provincial database managed by the OBBN. Monitoring programs can provide valuable information on the management of aquatic ecosystems and can indicate the success of current restoration projects conducted by Parks Canada and local Sportsmen’s Associations, and furthermore, the effectiveness of current management practices on private lands. With the largest remaining intact forest in southern Ontario, it is important that we understand these ecosystems so that we can ensure their future sustainability on the Bruce Peninsula. By monitoring changes within our forests over a long period of time, we can gain valuable information on the structure and composition of our forests, the impacts of natural and human stresses, and furthermore, an early warning of potential ecological problems. With this information, our community can make more informed decisions to manage our forests in a way that ensures both their ecological and economic sustainability. Good decisions based on good information are ultimately what “building capacity” is in the biosphere reserve concept. In 2002, the Bruce Peninsula Biosphere Association initiated a forest ecosystem monitoring program on the Northern Bruce Peninsula to compare the state of the forests in the protected core area within the Bruce Peninsula National Park and the surrounding working landscapes of the Municipality of the Northern Bruce Peninsula. Based on protocols from the Ecological Monitoring and Assessment Network (EMAN), sixteen permanent monitoring plots have been established on both private and protected lands throughout the municipality . These monitoring plots are stations designed to examine various aspects of forest ecosystems using forest species as indicators of changes to the ecosystem. 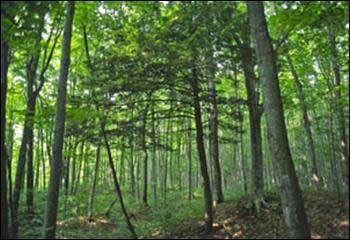 In 2002, a long-term monitoring program was initiated to assess the health of forest ecosystems on the Bruce Peninsula. Monitoring these plots over an extended period of time allows the community to better understand forest ecosystems, detect local and regional environmental changes, and furthermore, make informed land management decisions. Several aspects of trees are inventoried, including structure and composition of mature trees, tree health, seedling and sapling regeneration, and decomposition. It is thought by many people that lichens are simple organisms, much like any other type of plant but, in fact, lichens exist as a special relationship between a fungus and algae. Lichens easily absorb chemicals from air and rainwater, which can affect this delicate relationship, causing the lichen to die. Because of this sensitivity to environmental stress, lichens are good indicators of changes to forest ecosystems, particularly in air quality. Through continuous monitoring of lichen diversity and abundance, trends in environmental change can be assessed over time. In forest ecosystems, Eastern red-backed salamanders play an important role in terrestrial food webs. They are also indicators of forest health, meaning their presence indicates a healthy forest while their absence is a red flag. This is because salamanders breathe through their skin, which makes them sensitive to changes in the environment. The salamander’s physiology, long life span, and habitat loyalty makes them ideal barometers of forest health. Since 2003, the BPBA has monitored salamanders at eight forest plots. Salamander monitoring plays an important role is assessing the long-term trends in the health of our forests.